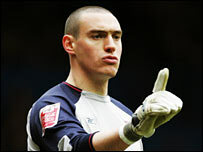 West Ham keeper Stephen Bywater has joined Coventry City on loan until the end of the year. The 24-year-old saw his chances at Upton Park limited by the arrival of Shaka Hislop this summer. Bywater told the Stellar Group website: "The prospect of playing under Micky Adams in a new 32,000-seater stadium at Coventry was too good to turn down. "I have heard from a number of players what a good boss Micky Adams is and I was very happy to learn under him."